At this moment, the unconscious Jin Ling suddenly sat up. In front of the two, he clumsily stood up with closed eyes. Wei WuXian wanted to see what he was going to do, so he didn’t do anything as Jin Ling slowly walked around him, took one stride, and stepped back into the wall where he stood just a while ago. He placed his arms flat beside his body. Even the position was the same as before. Wei WuXian pulled him out of the wall again, feeling that the situation was both hilarious and strange. As he was about to tell Lan WangJi that it was best not to stay here for long, he suddenly quivered out of fright, hearing a few barks that came from afar. Ever since they went in, the black-haired spiritual dog behaved itself, wagging its tail as it sat before the entrance. It waited for them to bring back its master in an anxious yet pathetic way, without barking anymore. However, right now, its barks were fiercer than ever. The two quickly went back the same way they came. Bending down to exit, they saw the spiritual dog face them with its back, growling with the bottom of its throat at a certain direction. 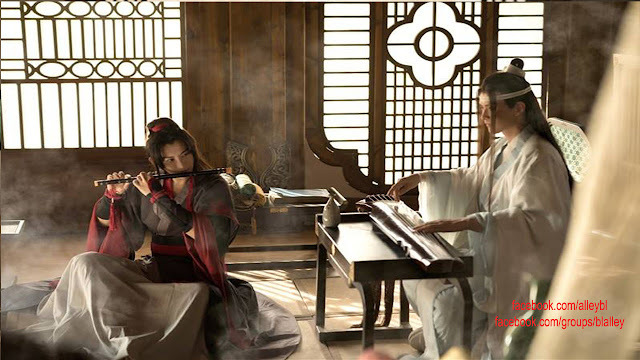 Although Wei WuXian managed to come over, he really couldn’t bear this type of sound, and involuntarily took a few steps backward. When the dog turned around and saw that he had Jin Ling on his back, it instantly dashed over, causing Wei WuXian to scream. Lan WangJi shifted in front of him just as he was about to throw Jin Ling down. Lan WangJi had to come back again. He looked down at the black-haired spiritual dog. Too scared to put up any resistance, it yapped as it trailed behind Lan WangJi, turning around to look at Jin Ling once in awhile. Wei WuXian wiped a few drops of sweat from his forehead. After he looked at the group of white castles once more, he picked up Jin Ling again and went down the Xinglu Ridge. At the moment, it was already near dusk. With a boy on his back and both of them covered in dirt, they received a lot of attention from passersby. Wei WuXian went back to the street where Jin Ling used the dog to chase him and found an inn. Using the money he fished out of Lan WangJi, he bought two new outfits and got a room. He first took off Jin Ling’s sect robe, which had been crumpled after it was buried in dirt, then pulled off his boots. Suddenly, his movements came to a halt. There appeared to be an area of shadow on Jin Ling’s lower leg. Squatting down and rolling up the boy’s trousers, Wei WuXian discovered that this wasn’t a shadow, but a black bruise. And, it wasn’t a bruise that came from being injured, it was a Curse Mark. A Curse Mark was a marking made by an evil being on its prey. If it appeared, it meant that the person had offended something of extreme malice. If it left a mark, it would find you no matter what, possibly after a long time, and possibly tonight. The consequences ranged from having the body part with the marking taken away or just death. Jin Ling’s whole leg had turned black, and the bruise was still stretching upward. Wei WuXian had never seen a Curse Mark in such an intense shade of black and covering such a large area. The more he looked at it, the sterner his face grew. He put Jin Ling’s legs down and undid Jin Ling’s undergarment. He only felt relief after he saw that his chest and stomach areas were all clean, not affected by the Curse Mark yet. At this moment, Jin Ling opened his eyes. With a muddled look, Jin Ling did as he was told and put the sword down. When they played Inquiry, although Jin Ling’s soul left his body and he couldn’t remember a lot of things, amid the haze, he knew that it was the person in front of him who dug him out and carried him down the mountain. For some time, after he was buried in the wall, he had been conscious for a while, the fear and despair in his heart at their height. Yet, he really didn’t expect that the one who freed him from his fear and despair was this person whom he had hated ever since the first time they met. The color of his face switched back and forth between white and red. He was also both dizzy and embarrassed, his thoughts still fluttering everywhere. Suddenly, his eyes went toward the window and was shocked to see that the sky was already dark, with a few stars scattered here and there. Coincidentally, Wei WuXian bent down to pick up the new clothes that fell on the ground. Jin Ling hopped off the bed, put on his boots, grabbed his jacket, and sprinted out of the room. Jin Ling ran as he put on his soiled, crumpled sect robe, “Don’t follow me!” He was light on his feet and stepped out of the inn in a few long strides. After chasing for a few blocks, Wei WuXian actually lost him. It appeared that Jin Ling didn’t come to Qinghe alone. Well, no wonder. Last time, at Dafan Mountain, Jiang Cheng had been there to assist him, so why wouldn’t he have come this time? However, looking at this now, it seemed that the two had a quarrel in the town of Qinghe, which was why Jin Ling went up the Xinglu Ridge alone. The reason why he hastened to run away was probably that Jiang Cheng threatened to do something to him if he didn’t come back before dark or something like that. Wei WuXian considered, I don’t know about anything else, but Jiang Cheng was quite right when he scolded that Jin Ling had the temper of a young mistress. It was chased into some random corner by Lan Zhan. Just as Wei WuXian was thinking, two familiar barks came from the other side of the alley. Wei WuXian’s demeanor changed at once. Legs moving on their own, he rushed outside as if he was chased by poisonous arrows. The black-haired spiritual dog sprinted over from the other end, passed Wei WuXian, and threw itself toward Jin Ling’s legs, affectionately brushing him with its tail. With the dog appearing here, it must have meant that Lan WangJi had already caught whoever was spying near the stone castles and went to point of rendezvous that they settled on earlier. However, at the moment, Wei WuXian had no time to think about these things. As he ran, he just happened to end up right before Jiang Cheng, Jin Ling, and a bunch of other Jiang Sect’s disciples. After both sides stayed still for a moment, Wei WuXian silently turned around and fled. Having only managed a short distance, he heard a sizzling noise, and a purple electric current wrapped around his lower leg as if it was a snake. Numbness and pain surged through his body from bottom to top, and he fell at once, after a pull from behind. Then, someone picked him up with the back of his collar. Wei WuXian immediately tried to find the Spirit-Locking Bag, but the other grabbed it before him. Jiang Cheng walked a few steps while holding him, entered the nearest shop, and kicked open the wooden bolt that was already half-latched. The owner was getting ready to close the shop for the night. Suddenly, seeing that a fancy-clothed, dark-faced young man kicked open the door and walked inside with someone in his hand, appearing as if he was going to disembowel the victim right here, the owner was so frightened that he couldn’t speak. A disciple went up and whispered a few things in his ear. With some silver pushed into his hands, he quickly fled to the back of the hall and never came out again. Without any further instructions, the Jiang Sect’s disciples instantly spread out from the inside to the outside, making it so that nothing could enter or escape the place. From the beginning of his memory until now, Jin Ling had never seen such a look on Jiang Cheng’s face before. This uncle of his who led the prominent YunmengJiang Sect ever since a young age had always been cold and dark. When he spoke, he was willing to neither show mercy nor do good. Yet, right now, although he was trying hard to suppress unnecessary facial expressions, his eyes were alarmingly intense. Although his face had always been clouded, marked with arrogance and satire, it seemed as if every corner of it had come alive. It was difficult to determine whether it was vengeful wrath, fathomless hatred, or raving ecstasy. Sabers: This was translated as “sword” in the last chapter, but, thanks to a few commenters, it is now changed to saber, a more accurate phrase. Curse Mark: The literal translation is “evil curse mark/scar”.